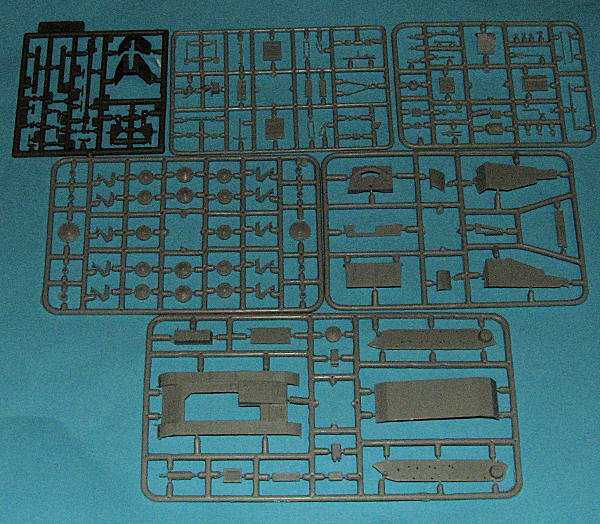 Many of you have built Ace kits and they offer a good quality product for a reasonable price. Ace tends to produce short run or low pressure mold kits of subjects that the major brands have ignored or not yet done. 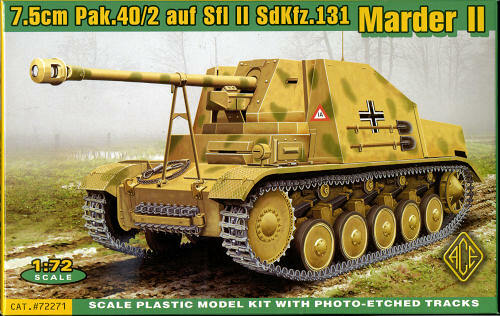 Such is the case with this Marder II kit. 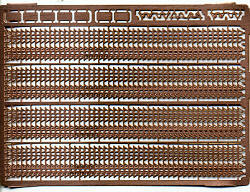 Produced on seven sprues, of which one, for the gun, comes from Roden, the parts are well molded with some small amount of flash (actually just largish mold seams), and a tendency for the really thick bits to have sink areas. All of this is taken into stride by those who like to build these kits so it isn't a deal breaker by any means. The basis of the kit is the Panzer II and one gets pretty much a stock lower section from that vehicle. The upper hull and the gun are what make this a Marder and for that, there are additional sprues to cover these differences. The kit provides a partial interior as the Marder is an open vehicle. There are small items to go on the interior side walls as well as behind the shield. The double shielded gun is on a sprue developed by Roden for some of their armor kits. One of the highlights of this kit is the etched tracks. These are actually pretty neat. One simply folds them over to provide track depth. The guide teeth are then bent upwards. They can then be formed, painted and glued in place. A similar set is done in aftermarket by Intech and those who have used them comment on how nice they are. Instructions are the usual folded sheet of paper with instructions on one half. The drawings are well done and, as usual, no painting info during construction is provided so you are on your own as to how to detail stuff. There are four options, all in Panzer Yellow with green or brown splotches. They are all Eastern Front with one being an unknown unit, one from 7th Luftwaffe Field Division, one from 560th Panzerjaeger Abteling, and one from Fuhrer Begleit Division 'Grossdeuchland'. The small decal sheet is off register but since only two markings are affected, it isn't a big deal. Thanks towww.scale-model-kits.com for the preview kit. Get yours at the link and at a discount.